It could shift the focus in the search for the universe's missing particle. The search for the universe’s missing particles, supposedly taking up as much as 80% of the total mass of the universe, hasn’t really yielded definitive results. Different theories have been put forward to understand dark matter — with some even saying may not really exist. Physicists from Cornell University offer an explanation that changes the way we understand dark matter, and could explain why all the search so far has been for naught. Supposedly, there used to be more dark matter around in the universe than what we have today. One theory explains that the decrease is based on assuming dark matter particles are WIMPs or weakly-interacting-massive-particles. As the universe cooled, dark matter annihilated away up to a point when thermal equilibrium was attained, when dark matter particles remained mostly constant after ‘freezing-out’. The Cornell physicists, publishing their study in Physical Review Letters, offer a different take on dark matter freeze-out. Instead of just one particle, several dark sector particles co-decayed producing the current dark matter density observed. One or many of these particles could be dark matter. According to the new research, it might be of a smaller density than previously assumed. To explain this correct abundance of dark matter, its annihilation rate must’ve been larger than what’s explained by earlier models, such as the WIMP concept. In the new concept, dark matter is said to have decoupled from the standard model of particles earlier on, causing disequilibrium. The decay started at a later point and freeze-out began much later, as well. 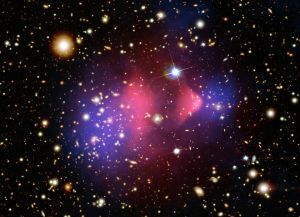 This type of dark matter’s “properties suggest that the current experiments would not be sensitive to [it], but it can lead to other, unique experimental signatures,” Kuflik said. “Furthermore, the mechanism is quite general and will be realized in many extensions of the standard model of particle physics.” Co-decaying dark matter requires more indirect-detection experiments in order to be found.